I wasn’t quite ready to finish celebrating the national championship, so I decided to drive up to the celebration on Tuesday evening. Even though this was a very environmentally irresponsible decision, the Aaaahj and I drove up with Biddy and Kleiner, so the carpool made it a more reasonable decision. Plus the company couldn’t be beat. Many Simpsons quotations were said. We arrived in Duluth at 5 PM, so we had plenty of time to fart around before the main event. Unfortunately, I felt like hot garbage. I have some kind of mini-influenza going on – aches, chills, fatigue – and realized upon arrival that I should have stayed home. But it was my last chance to see some of the seniors, and I wanted another signed poster. FORESHADOWING! This was my first time in Duluth since I moved, which was bittersweet and way too brief. I was welcomed back with some snow. I think I need to move to Dubai. Because we were so early, we decided to get in line to take photos with the trophy. Biddy and Kleiner had already gotten more, um, candid photos with the trophy, but I hadn’t gotten any quality time with it yet. I probably should have sat down, since I was feeling completely out of it, but was trying to fake it till I made it rather than succumbing to my illness. The line moved fairly quickly, and we were all able to get pix. 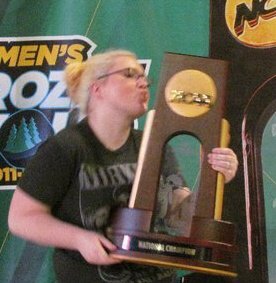 In 2011, I picked the trophy up and made out with it, but that didn’t seem… acceptable this year. They had a staffer there taking the photos for people, and no one ahead of me seemed to be picking either of them up, so I toned it down. We sat down to wait for the ceremony to start, and people-watched. The band came in and played a few songs, and then Howie got up and spoke for a bit before introducing the team. They all filed out in their nice polos, and for some reason Kobe Roth and his crutches were right in the middle, so he held everyone up. Now I’ve forgotten a lot of what happened during the actual presentation. They showed the intro video, then Howie talked a bit more, then the mayor proclaimed it Bulldog Hockey Victory Day or something. (In 2011, Mayor Ness proclaimed it Jack Connolly Day, but I guess since Kuhlman is from Esko, it could not be Karson Kuhlman Day.) Sandy came up, put on his readers, and gave a nice “F*ck the Haters” speech. (Okay it wasn’t really that, but he did have a nice pointed jab at the media for being doubters. I mean okay yes a lot of people were doubters but you know, Sandy, you did lose to Alberta.) Kuhlman got up and said a few things, and then we watched a video of the playoff run. Jack Connolly was on hand for some reason. That reason was not revealed to us. Also it was not revealed to us why he was dressed in dark clothing with a knit cap, as if he was going to rob the place later. That was all fun and games, but stuff was about to get real. In 2011, they set up the autograph table in the concourse on the end with the windows, and then the line snaked around the concourse. I was at the very end of that line, and waited 3.5 hours to tell Christian Gaffy that my hair was breaking off. I did not use that 3.5 hours to think of intelligent things to say. Although last year I went to the runners-up celebration and Dan of the Week and I got up to Tufte and Dan said “I went to Blaine,” and then we all stood there awkwardly, so this problem is not limited to me. This year the autograph table was set up on the floor in front of the benches, and people lined up before the ceremony started, so they wouldn’t have to wait. At the end of the ceremony, the line had grown and was headed off the floor and up the stairs. We got up and joined the back of that line, because that was clearly the line. However, many people seemed to think that wasn’t actually the line. A couple hundred people decided they could just make a new line, like some kind of zipper merge situation, and no one from tUMD did anything about it. The line also seemed to get fatter than it had been at the start, and was 3 or 4 people wide on the floor, when it had been 1 or 2 people wide before. So there was rampant budging going on unchecked. We ended up not moving more than a foot for like 30 minutes. That was partially because Karson Kuhlman didn’t join the autograph line until people had already started going through, which was holding things up. He was probably off giving an interview or something, but come on, people! Media get plenty of access to players – fans rarely get an opportunity for a meet and greet. An hour or so later, when we finally reached the bottom of the stairs, Bruce Ciskie came over to chat with us for a little while. We discussed what national championship gear we would be purchasing. I put in my order today (sweatshirt, gold t-shirt, puck, and pin); Bruce is still unsure. Apparently I should have purchased something on Tuesday, because an hour later, when we finally were getting close to the front of the line, an athletic department staffer came through the line and informed us they were likely to run out of posters. Yeah I was not really happy, considering the crowd control issues, the long drive, the long wait, and my influenza/consumption/vapors. I hate being such a rule follower! Why couldn’t I have also budged? Apparently there were no consequences! As we got closer to the front of the line, we saw the stack of posters dwindling. Some people in line had other things to get signed, others already had posters (they handed them out in advance, which could have been part of the problem, if people were taking stacks), but the stack still got down to zero with about 20-25 people in front of us. I politely (yes actually politely) but assertively expressed my displeasure with the crowd control issues to Jay Finnerty, Associate Athletic Director for Revenue and Special Projects. He had been strutting around the table all evening, so it certainly took me as a surprise when he quite rudely said he didn’t have any idea what I was talking about, and when I told him a couple hundred people had cut the line and now they were out of posters, he just walked away. Look, I don’t give thousands of dollars to the athletic department (and when I’m in a position to donate thousands of dollars somewhere, it’ll be to food-based charities or abortion providers), so I realize that no one needs to kiss my ring, but it seems like one of the basic tenets of customer service is not to sneer at the customer and walk away without even acknowledging there was a problem. So that made me even more annoyed. I mean, I’m an alumna, I’m a multi-sport season ticket holder, and I’m a dedicated fan. Maybe it wouldn’t cost you anything to just acknowledge there was a problem. Fortunately the actual athletic director and Brian, another assistant DA, came to the rescue. The were contrite, acknowledged there was a problem, and they provided a solution – I could email the athletic department and they would mail me a poster! I thought a better solution would be to give me a game worn jersey, but it’s not meant to be. We all decided we were going to go through the line anyway. Kleiner had a flag he wanted signed, and Biddy was getting Rachel’s flag signed, although she only needed two signatures, since she’d gotten the rest last Friday. I had absolutely nothing on me that could be signed, and neither did the Aaaahj, plus I was too cranky to go buy something to take the place of the free thing. Even though, yes, I just spent $100 on stuff today. Still. It was the principle. So, going through the line with nothing is EXTREMELY AWKWARD. Wow. I mean, it’s bad enough going through the line being me, but going through the line being me and having nothing to autograph when the ostensible purpose of going through the line is to receive autographs is just off the charts awk. Since they’d been signing autographs for two hours at that point, they were all kind of zoned out (although they did get pizza – I considered asking them to sign a pizza box) and kind of looking down the line for the next poster to sign. So then when I had nothing to sign, I ended up kind of standing there with nothing to say and no eye contact. It wasn’t a great situation. I had a nice chat with Ben Patt about his video board stuff during the Frozen Four – he was so funny! So now the season is finally over for me, and I can relax in the off-season, or at least turn my focus to the Wild’s playoff “run,” short as it may be. These 6+ month seasons are starting to become routine, but they can be draining, even for a fan! As always, thanks for reading RWD and sharing the crazy ups and downs of the season with me. It’s been a crazy journey and I’m glad we could take it together. I just wanted to say thank you for this blog. I’ve been a long time reader of your blog and just started officially “following” so this is my first comment. My wife and I are also season ticket holders and alumni and we went out to Chicago last year as well as St. Paul this year! What a fun ride it has been! I always appreciate and look forward to reading your perspective on the team. We took our 9 month old son to the frozen Four this year and we took him to the celebration on Tuesday. We shared many of the same disapppointments as you. We weren’t quite sure what to expect but we were hoping to meet some of the players and get autographs. We should have just lined up right when we got there but by the time we realized how long the line was, it was just too much! We got to see Champ which is always nice! Anyways I will quit rambling but again just wanted to say thank you and that you are a fantastic writer! Thank you, Stefano! What a neat experience – a Frozen Four with no kiddo in 2017, and then a baby to share it with in 2018! I’m glad you are reading! Can’t wait to see what next season brings!